LG: Analyze the pattern of 3 and the motif of cheating death in “The Pardoner’s Tale”; compare/contrast with Oedipus. 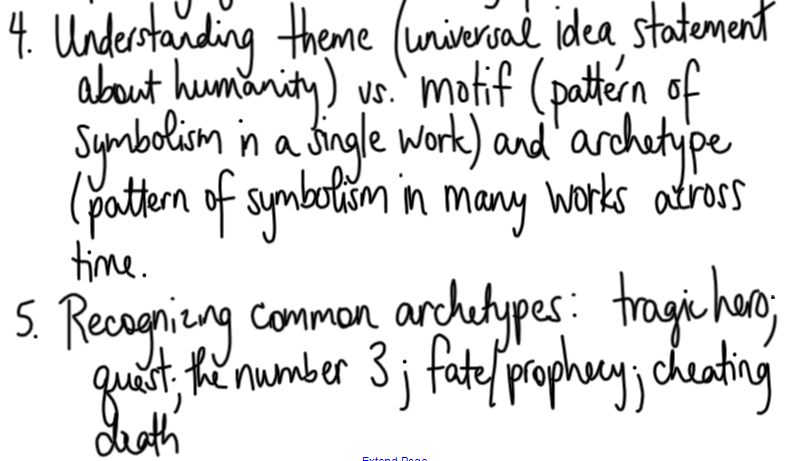 LG: Synthesize understanding of how authors draw from source texts and use similar patterns (archetypes, motifs, themes). LG: Revise your synthesis essay, adding sophisticated vocabulary and sentence structures. LG: Experience the immigrant experience and the idea of game play. Participate effectively in collaborative discussions. Meet your new Chinese family and play a game. Anticipation Guide: Assess statements about The Joy Luck Club; assert your opinion and persuade others to see your viewpoint. 2. Discuss anticipation guide; summarize thematic connections to look for in Othello. 3. Introduce museum research projects and select novels. *Homework: Complete the “Top 3 Novel Choices” survey in Schoology after researching the options for the museum project. Learning Goal(s): Use further research to enhance your understanding of a literary text; develop effective presentation skills. 2. Review Othello 1.1; complete discussion from Tuesday. M 8/22—Oedipus performances begin; bring masks and any props or “costume” pieces you would like to use. LG: Participate effectively in collaborative discussion and enhance presentations with digital media. Complete peer evaluations and self-reflections of performances. LG: Apply skills for close reading, gathering evidence, and making inferences to passages. Finish group performances, peer evaluations and self-reflections. View Greek urns; choose one and compose a narrative based on the pictures, including imagery to enhance the narrative. Illustrate an urn to demonstrate analysis of imagery within the text. Select a scene from Oedipus to represent artistically on your urn. Draw the scene, rooting your artistic rendering in the text-based descriptions. Place the text evidence that supports your depiction on the space around your urn; make sure to use lead-ins with your quotes to provide context. Analyze the significance of the imagery, layering commentary with your quotes. 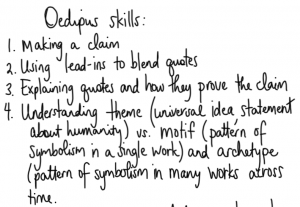 Writer’s workshop—analyze Oedipus as an archetype for the tragic hero or scapegoat. Analyze fragments of Saphho’s poems; using images from Greek paintings, sculptures, and artifacts, pair Sappho’s fragments of poetry into strophic and antistrophic pairings. Consider elements of poetry such as structure, imagery, sound devices to make meaning. Compose a response to the open-ended prompt (2003 AP Lit). *Homework: Revise/edit In the Lake/Streetcar, submit to Turnitin.com, print a clean copy to turn in NEXT Tuesday. *Homework: Finish reading/analyzing “An Occurrence at Owl Creek Bridge”; Schoology post due 11:59 p.m. Wednesday; Streetcar/In the Lake revised paper due NEXT Tuesday. LG: Collaborate with peers to explore motifs/patterns of imagery in text and their relationship to themes. Practice close “reading,” gathering evidence, and making inferences. Consider thematic concepts from Oedipus. Set up interactive class notebooks. Review Part I of Oedipus: Excavate the text for patterns of imagery/motifs: plague/disease/pollution/infertility, fame/shame, blindness/sight, dark/light, ignorance/knowledge/enlightenment, the number 3/unity/closure/spiritual awareness, god-king/scapegoat. With your Archetype/Greek family, dig into the text for your group’s assigned motif. Place text evidence on your poster: be sure to incorporate lead-ins, MLA citations, and of course, commentary as to the importance of the imagery to the work as a whole. Also, include on your poster a claim (theme statement) about the author’s purpose for using this particular motif and how it reveals a truism about the human condition. Homework: Commit 2 Membean words to memory: for each word, know how to spell it properly, its part of speech, nuances of use (connotations) etc. Be prepared to share your word “beans” in class tomorrow. LG: Practice close “reading,” gathering evidence, and making inferences. Consider thematic concepts from Oedipus. Share Membean words for review;begin building class word wall of sunshine words. Review PSAT grammar concepts: internal punctuation of clauses and verbal phrases: gerunds, participial phrases, infinitives. Respond to the following prompt: Trace Sophocles’ uses of a specific motif through the play. Consider the great polarities both Oedipus and the Thebans experience. How does the use of repeated imagery deepen our understanding of the play as a whole? PSAT challenge: Write a potential theme statement incorporating a verbal phrase. Design costumes, masks, props, and background images. Cut lines for performance. Count the total number of lines within the Episode. Divide by 3. Cut that number of lines from the total scene. Be sure that all important lines are left intact. Be sure all action flows despite missing lines. LG: Practice close reading, gathering evidence, and making inferences. Consider thematic concepts from Oedipus. Are there allusions present in the ode? Are there metaphors in the ode? What are they and what are they referring to? What is the point of view of the chorus? What other literary devices are present and what is their purpose? 2. Summarize the assigned strophic pair(s) and analyze the placement of the strophic pair(s) in the play. Create a visual depiction of the strophic pair(s) (scene in a comic book, poster with a series of images, etc.). 3. Collaborate with Greek families to prepare Oedipus performances. 4. Ticket out the door: summarize the stances of the debate presented in the strophe and antistrophe you read today. Collaborate with Greek families to prepare Oedipus performances. T 8/16–pop-up museum presentation; respond to Schoology by 11:59 p.m.
1. Review Edna St. Vincent Millay poem from ½ length exam; analyze strategies for answering multiple choice questions. 2. MCM #1—Poetry—practice strategies for analyzing poetry and answering multiple choice questions. *Homework: Read/analyze assigned chapters from Foster’s How to Read Literature Like a Professor; respond to discussion board on Schoology by 11:59 p.m. Tuesday. 1. Present In the Lake of the Woods pop-up museum research projects. *Homework: Read/analyze assigned chapters from Foster’s How to Read Literature Like a Professor; respond to discussion board on Schoology by 11:59 p.m. Tuesday. ; bring A Streetcar Named Desire or In the Lake of the Woods to class TOMORROW. 1. Review essay topics and pre-writing from last week’s discussion. 2. Compose a response to one of the open prompts from released AP exams. Learning Goal(s): Use textual evidence to support your analysis of the explicit and inferred meanings of a novel, including uncertainties; understand that texts may illustrate multiple themes with many implications. 1. Read aloud “Dulce Et Decorum Est”; introduce “horse” and “cart” metaphor for AP essays; compose theme statement using template; share within the group and combine into one quality statement for the group. 3. Compose an introduction and body paragraph in response to the poetry prompt. 1. Introduce Poetry Out Loud. 2. Discuss elements of style, comparing/contrasting film techniques with writing techniques: M. Night Shyamalan montage; Tim Burton montage, Hitchcock montage; Hitchcock opening scene and interview about Psycho. 3. Analyze images to preview reading “An Occurrence at Owl Creek Bridge”; model analysis of the opening paragraphs of the short story. M 8/8—Personal narrative draft and selfie due for revision. W 8/10—Personal narrative final draft due to Turnitin.com; selfie due to Google Drive. S 8/14—Complete vocabulary practice on Membean before class. LG: Collaborate with peers to create a personal presentation; explore vocabulary. Computer Lab: Set up Google Drive shared folder instructions and Turnitin HWL account. Assess vocabulary level on Membean and begin practice sessions. Polish personal narratives and selfies due Wednesday. Homework: Personal narrative final draft and selfie due Wednesday; complete 45 minutes of Membean practice by Sunday evening. Review vocabulary—list a word you learned yesterday on a Post-It note, including as much information as you remember. View “An Introduction to Greek Tragedy” https://www.youtube.com/watch?v=dSr6mP-zxUc and take notes with Greek tragedy questions. Read Intro to Greek Tragedy and Greek Theater; complete notes. If you defied your parents and did something wrong, what’s the worst punishment they could dole out to make sure you wouldn’t do such a thing again? Should a person be judged guilty of a crime if he/she is unaware that any crime is being committed? Is being self-assured ever a bad thing? Have you ever wanted to see a movie after having read the book? Why would you want to spend the money if you already know the story? Homework: Personal narrative final draft and selfie due Wednesday (submit to your Google folder); complete 45 minutes of Membean practice by Sunday evening. 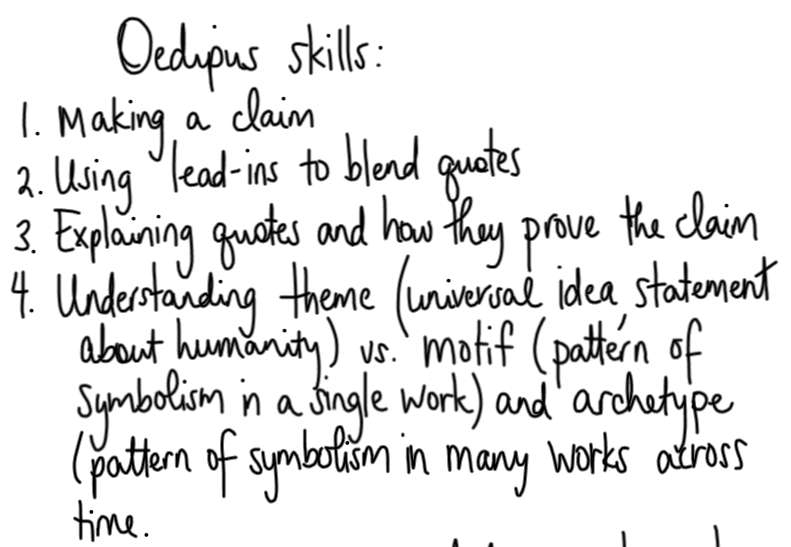 LG: Analyze Greek culture and patterns of symbolism in Oedipus. My Favorite No: Analyze examples of poor clause recognition/sentence punctuation and correct these issues in your personal narrative. Review characteristics of a tragic hero (Tragic Hero ppt). Review “Structure of Oedipus” chart; read p.460-7 in textbook. Assign Oedipus Rex performance assessment to Greek families. Homework: Complete 45 minutes of Membean practice by Sunday evening. In Greek families, complete the following work. Divide the questions among all group members. For instance, Kaela will write all Reading Strategy questions, Gabe will write all Literary Analysis questions, etc. Turn in all work at the end of the period. Read Oedipus the King Part I in the textbook p. 468-499. Answer all questions in the margin: Reading Strategy (11), Literary Analysis (11), Critical Viewing (5), Reading Check (15). Identify the question with the page number (example: Reading Strategy #1 p. 469). Answer questions #1-8 on p. 499. Answer questions #1-9 on p. 500. Read Oedipus the King Part II in the textbook p. 503-525. 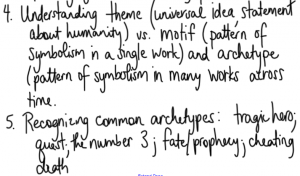 Answer all questions in the margin: Reading Strategy (9), Literary Analysis (8), Critical Viewing (4), Reading Check (11). Identify the question with the page number (example: Reading Strategy #1 p. 469). Answer questions #1-7 on p. 524. Answer questions #1-9 on p. 525. Homework: Complete 45 minutes of Membean practice by Sunday evening; prepare props/costumes/performances for Oedipus Rex. Participate in Socratic discussion of Streetcar. *Homework: Review In the Lake of the Woods. Learning Goal(s): Use verbal interaction and collaboration with peers enhance your understanding of a literary text; refine your verbal collaboration skills. Computer Lab Visit: Create shared Google Folder; set up Schoology (class ID F7V6K-2KZNJ) and Membean accounts; submit Streetcar precis to Turnitin.com (class ID 11014604; password sanford); complete pop-up museum research for In the Lake of the Woods; collaborate and create a presentation of findings (present Tues. Aug. 16). *Homework: In the Lake of the Woods presentations due Tues. Aug. 16; practice Membean vocabulary 45 minutes by Sunday, August 14, 9:00 p.m.
*Homework: Review In the Lake of the Woods; practice Membean vocabulary 45 minutes by Sunday, August 14, 9:00 p.m.
Learning Goal(s): Use textual evidence to support your analysis of the explicit and inferred meanings of a poem, including uncertainties. Computer Lab Visit: Complete pop-up museum research for In the Lake of the Woods; collaborate and create a presentation of findings (present Tues. Aug. 16). Meet with pop-up museum groups to plan Tuesday’s presentations. *Homework: Practice Membean vocabulary 45 minutes by Sunday, August 14, 9:00 p.m.; read/analyze assigned chapters from Foster’s How to Read Literature Like a Professor; respond to discussion board on Schoology by midnight of Thursday; In the Lake of the Woods artifacts/pop-up museum presentations due Tuesday.